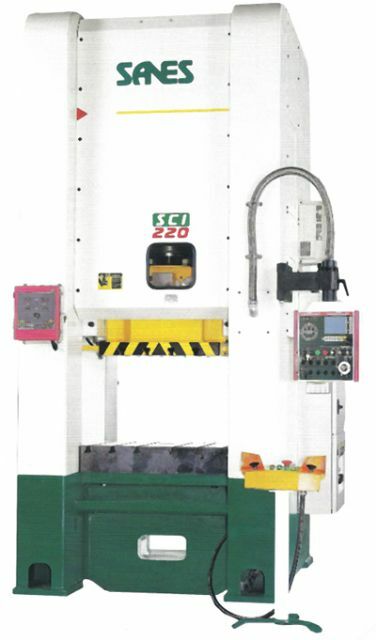 Sep 04, 2015 | By CENS | SANES PRESSES CO., LTD. Founded in 1980 in central Taiwan, Sanes Presses Co., Ltd. builds mechanical and forging presses for both general and special purposes. A local pioneer, the maker released the first Taiwan-built 4,000-ton hot forging press in 2014, the first Taiwan-built fine blanking press in 2003, the first Taiwan-built hot forging press in 2000, and the first Taiwan-built link press in 1991. The machines feature slow feeding yet fast output, considerably reducing operational noise and vibration while increasing productivity and product rigidity. The company received an award in 1994 from the Taiwan Forging Association for its excellent forging technology development and a similar award each in 2002 and 2003 from the Small and Medium Enterprise Administration under the Ministry of Economic Affairs (MOEA). It is also a CE- and ISO9001-certified maker. The above achievements are attributable to the company's diligent efforts in improving manufacturing technology. In addition to taking on Japanese engineers in 2009, the company deployed European boring machines and gear-grinding machines in 2004 and 2005, respectively. In 2014, the company purchased heavy-duty CNC gear grinders from Swiss MAAG. The company began exporting its machines to Japan in 1985, after which it has steadily expanded sales to that critical market, including shipments to Japan's leading forging company--Asahi Forge Co. In addition to machinery production, Sanes provides mold-making (tooling) service. Sanes has built solid technical strength, upheld by precision manufacturing equipment, stringent quality inspection, scientific management, and well trained R&D specialists. Its R&D unit designs every machine based on customers' customized needs. The maker has earned strong reputation in overseas markets due to the smooth and efficient operation delivered by its machines, as well as the company's ability to exactly meet customer needs. A pressing machine from Sanes Presses.